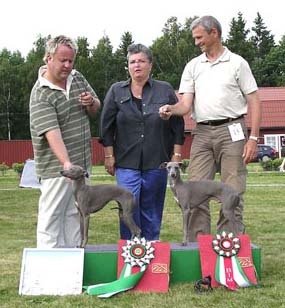 Svensk rasklubb för italiensk vintund hade rasspecial 26/7 2003 Domare Agnese Spaziani Kennel Batter ‘Dali från Italien. Det var 30 anmälda plus 4 valpar. BEST IN SHOW PY’S HAZA! Much type, important female full of herself, proud and gentle at the same time, beautiful expression. correct topline, beautiful angulation, sound movement. presented in perfect condition, really a show dog!